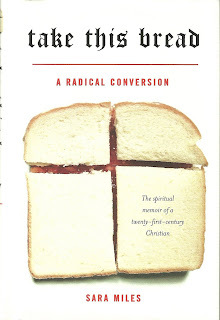 WOUNDED BIRD: THOUGHT FOR THE DAY - JESUS SAYS "TAKE THIS BREAD..."
THOUGHT FOR THE DAY - JESUS SAYS "TAKE THIS BREAD..."
I've never been quite the same since I read Sara Miles' Take This Bread: A Radical Conversion. If you haven't read the book, I recommend it highly. Sara tells the powerful and moving story of her initial conversion and the manner in which she continued to grow and live out her transformation. Secular and unbaptized, Sara's conversion began when she walked into St. Gregory of Nyssa Episcopal Church in San Francisco and took Communion for the first time. Eating Jesus, as I did that day to my great astonishment led me against all my expectations to a faith I'd scorned and work I'd never imagined. The mysterious sacrament turned out to be not at symbolic wafer at all but actual food - indeed, the bread of life. In that shocking moment of communion, filled with deep desire to reach for and become part of a body, I realized that what I'd been doing with my life all along was what I was meant to do: feed people. Sara still serves at St. Gregory of Nyssa as Director of Ministry and is the founder of the Friday Food Pantry at the church. Sara's book, which I read over a year ago, affected me profoundly and led to today's longish "Thought for the Day". Holy Communion is the Bread of Life and the Cup of Salvation. What human, be it the pope on down to the lowliest of priests and lay ministers, has the right to withhold the Body and Blood of Christ from another human? None! Not one! The Body and Blood of Our Lord Jesus Christ are to be freely given to all who desire them. Sara has a new book out titled Jesus Freak. Fr Jake posted a review. Some of you may recall our conversation a couple of years ago regarding Sara Miles' book Take This Bread. I'm pleased to be able to announce that Sara has completed a new book; Jesus Freak: Feeding - Healing - Raising the Dead. It will be out next month, but you can pre-order it now. I was fortunate enough to receive an early copy, and just finished reading it. I highly recommend it. Read the rest of the book review at Fr Jake's. I haven't read Jesus Freak yet, but I've ordered the book, and I will read it. I'm looking forward to reading her new book after reading Fr. Jake's review. Our church read it before we began our newest ministries with Feeding America. We had over 75 volunteers and more have signed up! We only have about 250 members too! Take This Bread is a lovely book, and I look forward to reading the next. I just pre-ordered her new book. I,too, was deeply affected by Take This Bread. And I periodically go over to You Tube and watch the videos from St. Gregory of Nyssa from their Holy Week celebration a few years ago. Such exuberant, heartfelt worship is such a sign of God's loving presence to me, here in the hinterlands of rightwing conservative Episcopal Churches, where I remain unchurched. Thanks for the heads up Grandmere! I have never heard of this woman or Take This Bread, but I plan to chase it up right away. Priscilla, I've watched the videos, too. The congregation dances! I'm sorry that you don't have a church. Cathy, I think that you won't be sorry if you read Take This Bread. Caminante, the book is perfect as part of a Lenten study series. God bless you and your congregation in your open soup luncheon outreach. St Gregory's is an amazing place and Sara Miles an amazing person. The Saints above are dancing too (wonderful frescos (icons) of dancing saints on the walls above). My friend Connie, who is in a wheelchair danced to communion there as well. Her feet tapping as she rolled forward. Amelia, I'd love to visit St Greg's. Lovely story of Connie dancing in her wheel chair.